A redesign is an exciting chance to freshen up the appearance and update the functionality of your business' website. When a business decides their website needs an upgrade, there is an opportunity to see positive shifts in SEO, an increase of qualified traffic or leads as well as provide their customers with a better user experience. 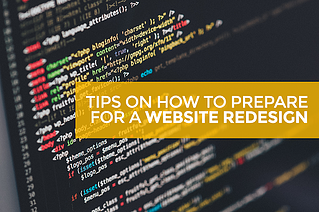 While the outcome of a website redesign is an exciting one, it's also a large project that requires preparation and organization. Here are some tips to help your business and team prepare for what is to come! Communication is key! It’s vital everyone involved in the project is on the same page. Setting realistic deadlines from the start will keep both teams moving forward and accountable. A new site without content is the equivalent of buying a new car without tires. You need tires to drive! One of the biggest setbacks through the development process can be waiting on content. Your site demands high-quality, relevant content that makes your business an industry authority. This is what Google says about content, that “the key to creating a great website is to create the best possible experience for your audience with original and high-quality content.” Google makes up over 60% of desktop searches and over 80% of mobile searches, so if they place that sort of weight on quality content you bet it must be an important ranking factor for your website. Identify your company’s website goals and objectives. What is your company hoping to get out of a redesign project? Whether the goal is to build your brand, increase organic traffic, develop into an authoritative resource for your industry, grow your relationship with existing customers, etc., it is important to pinpoint what your goals are before beginning the project. Your company’s goals and objectives should be conveyed within the new design and architecture of your site. Collect feedback from your team on what they do and don't like about your current site. As your team members are the experts in your industry, their feedback is extremely viable. For instance, if your team has feedback related to the functionality of your website from a conservation standpoint, you can implement this feedback in the design of the new site to improve performance. From a user’s perspective, what are your competitors doing right? What are they doing wrong? Understanding how your website stacks up against your competitors should directly influence the design of the new website. For example, if your competitor is surpassing your site in traffic rankings, is it because they have more indexed pages? Do they have more inbound links to their website? Create initiatives to ensure the new website has more product pages containing rich content and more inbound links. Technology and design trends are constantly changing, it’s important for companies to update and redesign their websites every 2-3 years. By following these tips and planning ahead, it should be a breeze. Next step: ensuring you have the right marketing and web design company to team up with for a website redesign!